Celtic manager Brendan Rodgers believes Alfredo Morelos will not need the provocation that Rangers counterpart Pedro Caixinha expects when the teams meet this weekend. The 21-year-old Colombian striker hit the ground running when he arrived at Rangers from HJK Helsinki in the summer and has scored eight goals so far. However, he could perhaps count himself lucky to have stayed on the pitch in the 2-2 draw with Partick Thistle last Friday night after appearing to kick out at Jags defender Jordan Turnbull. Ahead of the Old Firm clash at Ibrox on Saturday, Caixinha said he knew Morelos was "going to be provoked" but admitted he would target the player if he was in the opposition dugout. However, in his response, Rodgers said: "It is not really something we concentrate on. "I don't think he needs any help in that, watching the game the other night against Partick. "We really concentrate on ourselves. "He is a young boy who has come into the country and started his campaign well. "He has got some goals and wants to score goals and sometimes when you are young you can get a wee bit fired up, but we concentrate on our own work. "We always respect the other team and their qualities and focus very much on ourselves to get a good performance and result." 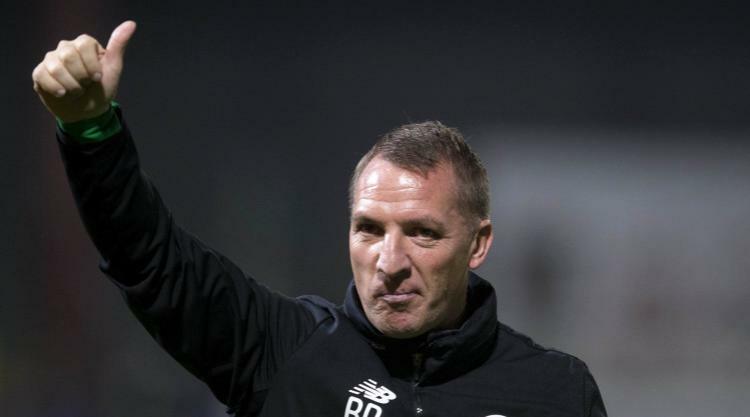 Rodgers also responded to retired Wales striker Craig Bellamy's claim that "no one" south of the border cares what the Hoops boss achieves in Scotland as success is expected. The Northern Irishman clinched the domestic treble in his first season in charge while going unbeaten in Scotland and he qualified Celtic for the Champions League two seasons running. However, Bellamy - who spent six months on loan at Parkhead in 2005 - said: "His reputation of a great coach is there, but getting one of the top jobs again in the Premier League might be difficult for him..
"If you do well up there, it's a case of 'so you should'. I just didn't feel it mattered to anyone down south." The former Swansea City and Liverpool boss said: "Craig is a guy I respect. He was a very good player who came up here so he understands what it is like up here. "I am not up here to work on my next move from Celtic. I am here because of Celtic. "I love my life here in Glasgow, I enjoy working for this club and preparing my team along with my staff for us to win and win well. "I am not overly bothered what it does for my CV. "My only worry is for Celtic, to do the best I possibly can here for the length of time I am here and we will see what happens after that. "After here if it takes me back to Ballymena United in Northern Ireland or elsewhere abroad or the Premier League so be it." Jozo Simunovic missed the 4-0 Betfred Cup win over Dundee at Dens Park on Wednesday night with a swollen knee in a game which saw fellow defender Dedryck Boyata feature for the first time this season after recovering from a knee injury. Striker Moussa Dembele, recently back from a hamstring injury, was rested and Rodgers is confident all three will be ready for the trip to Govan. He said: "Jozo has come through fine. He had a good training session today, he should be fit and in the squad. "Dedryck came through (Wednesday night) fine, we will assess him again tomorrow just to make sure but all good on that front. Moussa will be in the squad."